Who doesn’t love a nice portly, jovial cat? The sheer rotundity of felines should be in direct proportion to their good humor and amiable demeanors. Oh, but wait, we are discussing cats after all, who as a species, demand complete dominion over all mere mortals. We are therefore; taking extreme liberties thinking we can control something as mundane in their lives as, well, their weight. Cats like people do come in all shapes and sizes. There may be as many as 80 recognized breeds of “felis domesticus” globally and about 50 here at home in the United States. Needless to say, there is considerable variability in terms of their adorable furry bodies. Average life span is somewhere between 12 and 15 years these days. Every now and again you’ll hear of extreme longevity including the renowned Crème Puff, now deceased, but when living resided in Austin Texas and attained the ripe old age of thirty eight! Truth according to the Guinness Book of World Records. Do smaller cats enjoy longer lives? This theory holds true in the world of canines. It’s commonly accepted that small breeds such as Yorkshire Terriers and Maltese, tend to enjoy longer life spans than the giants of the dog world such as Great Danes and Mastiffs. This could well be the case for cats too. Feline obesity is no laughing matter. 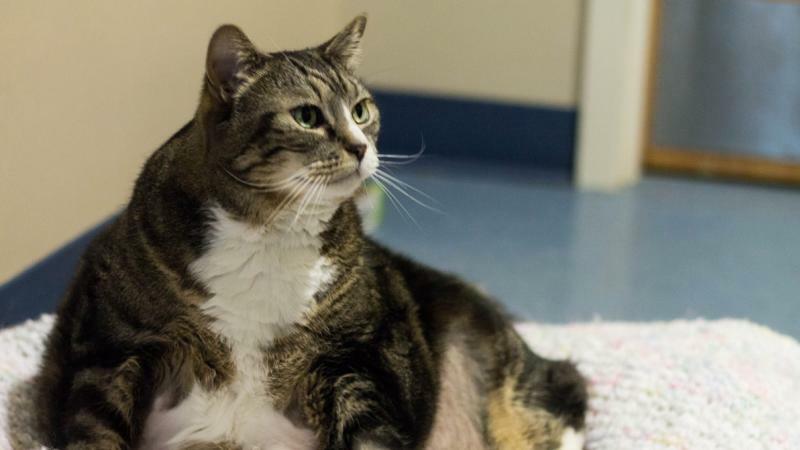 From the socially embarrassing inability to aim appropriately in the litter box, to not being able to maintain usual cat fastidiousness, to the clear and present danger of developing heart disease and diabetes, keeping a slim and trim physique equals happy cats and happy owners. Which means, for our voluptuous girls, Panda, Freckles and Momma, they need to accept Kitty Weightwatchers into their lives and get with the program! Leading the way to optimum size is our NHHS mascot (although certainly still hopeful of an adoptive home)the delectable Elle. This beautiful black cat has been calling our shelter home, incredulously since 2011. Elle has developed quite the following of staff admirers while still maintaining her aloof, queenly persona. Our veterinarian Dr. Siobhan Bach, prescribed a strict food regimen guaranteed to help her lose weight. It’s true, Elle had tipped the scale at over 14lbs moving her from being simply well padded into the realms of obesity. Her belly swayed and her legs bowed under the extra poundage she was hefting around. She was moody and uncomfortable much of the time. Proudly Elle now flits about the place and seems to look forward to her weekly weigh ins. She’s down to 11lbs and truly has renewed vigor as she easily negotiates staff desks, the lobby, all the high spots in the volunteer nook and continues to greet our guests. We expect Elle to be the shining example for the three newest recruits into Kitty Weightwatchers, surely permanent homes will quickly follow once they attain stature not inducing back problems for the humans who wish to hold them! Meanwhile our visiting public, volunteers and staff are encouraged to spend time with these cats, encouraging movement and play to increase their activity levels. Check out our Facebook link for progress reports.